This page brings together the scattered resources documenting the Crocker Land Expedition of 1913-1917. Many of these have now been digitized and can be explored online. Links are also provided to find and visit physical collections. Read More "Donald B. MacMillan"
Read More "Fitzhugh F. Green"
Read More "Walter E. Ekblaw"
Read More "Maurice C. Tanquary"
Read More "Lying on load on return of Crockerland Expedition"
Read More "Dovekies (Little Auk) in flight"
Read More "Getting Ice from Berg"
Read More "Kad-ah, No. Greenland boy"
The Crocker Land Expedition was a major scientific and exploration endeavor in the second decade of the twentieth century. The expedition had numerous goals, including gathering scientific data and collections from a little-known region of the far north, but the one that drew the most attention was the search for Crocker Land itself – a land that current scientific evidence as well as a possible sighting by Robert E. Peary in 1906 suggested lay northwest of the known Arctic islands. The expedition was co-sponsored by the American Museum of Natural History, the American Geographical Society, and the University of Illinois, with additional financial support from numerous backers, large and small. The expedition was led by Donald B. MacMillan and included six other men: W. Elmer Ekblaw, geologist and botanist; Maurice Cole Tanquary, zoologist; Harrison J. Hunt, surgeon/physician; Fitzhugh F. Green, civil engineer; Jerome Lee Allen, electrician and wireless radio operator; and Jonathan “Jot” Small, cook and handyman. 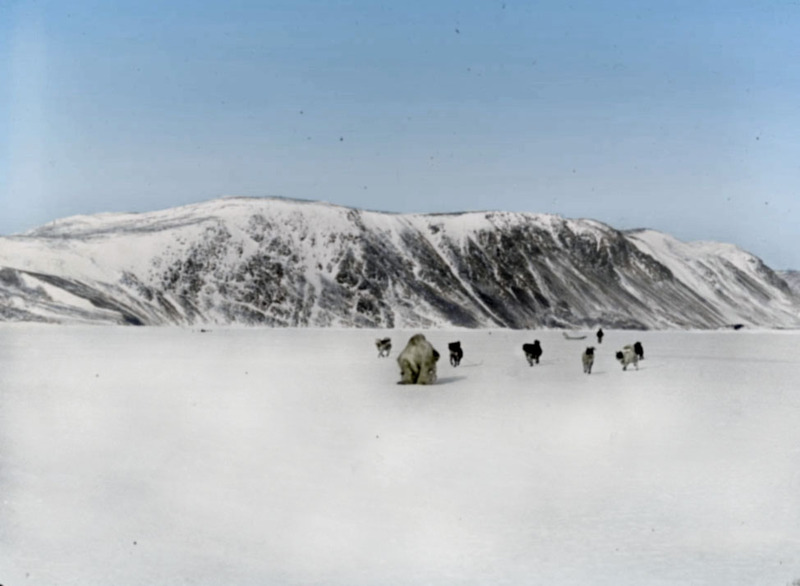 Their plan was to travel north in a chartered ship in the summer of 1913 , to establish a base on Ellesmere Island, in what is now Nunavut, and to prepare for a spring 1915 sledging journey across the island to the polar sea, and thence to Crocker Land. If they were successful, they would spend that time studying this new land, returning to their base when conditions allowed. Additional scientific research would be carried out in the vicinity of their base, until a ship arrived in the summer of 1915 to carry them home. As so often happens, many aspects of this plan did not play out as expected. In particular Crocker Land proved to be a mirage, and it is this “failure” to find new land that has come to define the expedition. To make matters worse, relief ships sent by AMNH in 1915 and 1916 did not reach them, or became themselves frozen in, forced to overwinter. Some expedition members managed to travel by dog sledge to Danish colonies to the south, where they could find passage to Denmark. But others including MacMillan stayed in the north, finally returning home in 1917. In addition to the sponsoring institutions, significant archival and photographic collections relating to the expedition are held by The Peary-MacMillan Arctic Museum and the George J. Mitchell Department of Special Collections and Archives. In 2015 The Gladys Kriebel Delmas Foundation awarded a grant to the Peary-MacMillan Arctic Museum to digitize the journals and hand-tinted glass lantern slides from the expedition housed at Bowdoin College. In total 70 journals and notebooks, 40 folders of correspondence, and 368 lantern slides were scanned in 2016 and 2017.